Last night, Amy and I went to the Raleigh Vineyard to catch the last session by Peter and Mary Ellen Fitch, pastors of St. Croix Vineyard in New Brunswick, Canada. We fell in love with them when they came a year ago and were grateful to get to spend a little time with them again. Peter shared stories about how God regularly speaks to their community, not through a spokesperson, but through the community itself. Then we broke into small groups and practiced the method that they use, which is the same method we often use at Vineyard North. One key component is that we sit together in silence for several minutes, waiting on the Spirit to speak into our hearts/consciences/imaginations for the person and situation we’re praying for. And it’s not just audible silence, the goal is to quiet our minds, to clear away preconceived notions, not to strive to think anything in particular. Just wait and see what surfaces. Most people get something when we do it this way and even the things that seem most random often mean something to the person we’re focusing on. It’s a neat process and often very powerful. Sitting in extended, intentional silence with a group of people only sounded like a weird thing to do until I tried it. Experiencing the peace and quiet power of being present has become both more normal and enjoyable as I’ve practiced it. The other thing that stood out to me last night was how far I’ve come from my Pentecostal upbringing in this regard. I grew up taught to expect the Holy Spirit to move but never in such a quiet, gentle way. Power and volume increased or decreased together. More than that, I was taught to distrust any form of spirituality that involved clearing the mind. That was Eastern, New Age stuff. Emptying my mind would just leave it vacant for demons to haunt. As I’ve learned, there are deep Christian roots to the practice of clearing the mind and waiting on the Spirit. As Peter explained to the group last night, we find this in Ignatian and Quaker spirituality. And as my own research has shown me, those forms of spirituality are more aligned with Pentecostal spirituality in other key ways. Pentecostals began by setting aside fear of theological and liturgical difference. It’s a shame that those crept back in. By the time I was coming up, we didn’t trust anyone but ourselves and I learned that mistrust dutifully along with the rest. All this hit me as we were driving home last night, that I really have unlearned what I had learned. I know I’m not alone in going through this process. There is an anemic version of each Christian expression that gets taught as normative and superior to the rest. But there’s also a deep Christian spirituality to be experienced and lived into. 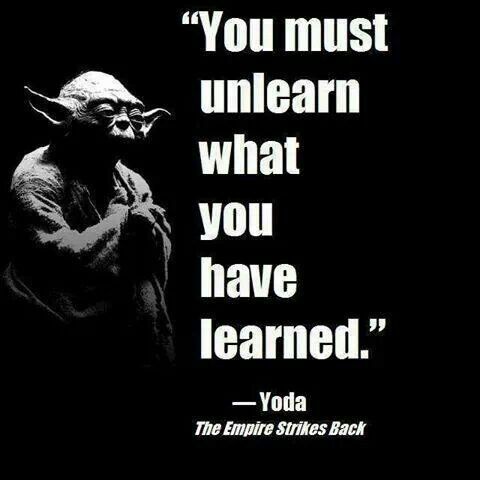 It requires unlearning what we have learned. Not as a one time thing but as an ongoing process. Even now, the Spirit has much to teach me that I haven’t learned yet – even though I have thoughts and practices in place that will have to be unlearned if I am to grow into what God has for me. Deep Christian spirituality isn’t a normative position or a superior theology. Rather, it is the rejection of self-normativity and the embrace of theological humility, in other words, suspicious of claims to superiority, especially the ones I’m prone to make. We have a deep seeded desire to be right and there’s the root of what we have to learn to unlearn.